When you’re a driver for Lyft, the most important thing to understand is that ridesharing drivers are independent contractors, not employees. That’s why Lyft doesn’t withhold taxes from your rideshare payments. That’s also why you’ll file taxes as an independent business owner when tax season rolls around. Use these tax tips to navigate your way through filing your self-employment taxes and minimizing your tax bill. If you generated more than 200 transactions and more than $20,000 in gross ride payments from passengers in the last year. This is the IRA requirement, however, you are likely to receive a Form 1099-K in the mail even if you have fewer transactions with less gross receipts. If you’re in Massachusetts or Vermont, you’ll get a 1099-K if you earned at least $600. If you earned at least $600 from non-driving earnings, such as referrals and bonuses, you should receive a Form 1099-MISC. If you did not reach these income thresholds, you can find a detailed breakdown in your Annual Summary from your Driver Dashboard (sign in to your account, look under the “Driver” heading, and select “Tax Information”). Your driver earnings will be posted online or mailed to you by January 31. It’s ok if your Tax Information doesn’t include everything listed—not all drivers have the same forms and expenses. Whether you receive a 1099 or not, it’s your responsibility to determine what you should report as taxable income. Read How To Use Your Lyft 1099s for a breakdown of how to use them to complete your tax return. When you review your income information on your Driver Dashboard or in Box 1a of your 1099-K, you’ll see that your gross ride receipts are likely greater than the amount you took home in earnings. That’s because the IRS requires Lyft to include everything that was charged to your passengers in the gross receipts. That includes the Lyft Fee, tolls, and other fees. Don’t worry. You can deduct these additional amounts from your income so you don’t pay taxes on them. Lyft makes it easy by providing annual totals for all these additional amounts on your Driver Dashboard. If you are using TurboTax Self-Employed, check out "How do I enter my Lyft tax information?" for step-by-step instructions. As an independent self-employed business owner—known as a sole proprietor—you’ll pay taxes on the profits you earn from your ridesharing business. You’ll report this income using Schedule C, Profit or Loss from Business. You’ll also use Schedule C to list your business expenses. To calculate the profit for your business, you’ll subtract your business expenses from your income. The difference goes on line 31 of Schedule C and on line 12 of your 1040. If this amount is $400 or more, you’ll enter it on Schedule SE, which is used for calculating your Medicare and Social Security contributions (self-employment tax). To jumpstart your business tax deductions, Lyft provides you with totals for some business expenses on your Driver Dashboard. This includes the Lyft fee, tolls, and other fees discussed above. It also includes the miles you drove while online. These are just the beginning of your business expenses. If you are using TurboTax Self-Employed, check out "How do I enter my Lyft tax information?" for step-by-step instructions. Add up the actual annual expenses of operating your vehicle in service of your business. These expenses include gas, oil, maintenance, repairs, auto insurance, and depreciation or lease payments. Or use the standard IRS mileage deduction. For the 2018 tax year, the rate is 54.5 cents/mile of business use. You drove 5,000 miles and paid $300 in tolls and parking fees. You must keep careful records of the business miles you drive when not online. The IRS can disallow mileage you can’t document with mileage logs or other records. As with business use of your car, you can only deduct the portion of your smartphone costs that apply to your business. That’s why many ridesharing professions buy one smartphone solely for use in their business. That way you can deduct everything associated with that phone as a business expense, making it simpler to save on your taxes. You may not meet the income and transaction thresholds that call for a 1099-K or a 1099-MISC. All Lyft drivers, however, will receive a 2018 Annual Summary document which will show you all earnings. You can find your Annual Summary through the Tax Information page of your Driver Dashboard. 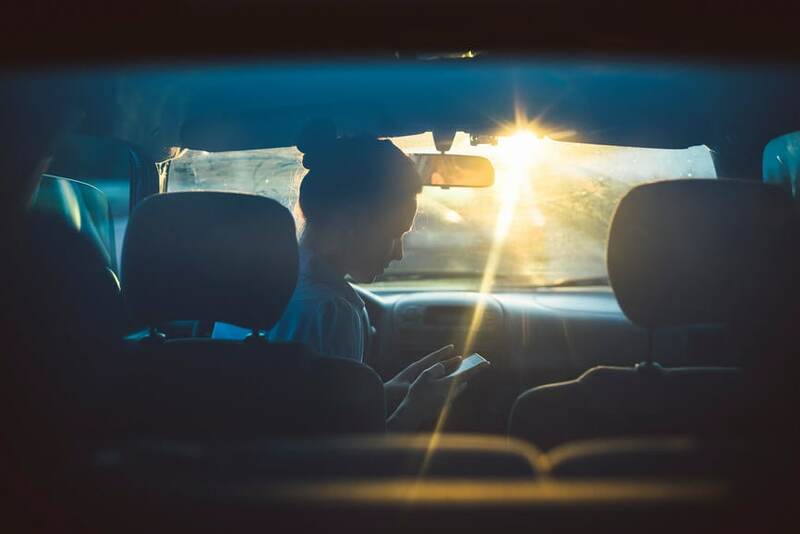 Your Annual Summary will not include the mileage when driving to your first passenger, between passengers and on the way home at the end of the day, so be sure to keep personal records of these miles separately. You should also keep personal records of the portion of your wireless plan used for business, passenger treats, parking/tolls, fees, phone accessories and your vehicle expenses. For your self-employment income, you will need to enter the gross ride payments amount and any non-ride payments such as referrals, incentive and/or bonuses you received. Once you have entered your earnings, it is time to start deducting! Use your Annual Summary to get your Lyft service fees, other fees you paid and your mileage for the rides you provided. Use your personal records for the mileage not reported on the yearly summary (driving to your first passenger, between passengers, and on the way home at the end of the day) and to deduct a portion of your wireless plan, passenger treats, parking/tolls, fees, phone accessories and your vehicle expenses. If this is your first year driving for Lyft, you can also deduct the cost of your initial inspection and background check that was required for you to start driving. Remember, with TurboTax Self Employed, we’ll ask you simple questions and fill out all the right forms for you to maximize your tax deductions. Check out "How do I enter my Lyft tax information?" for step-by-step instructions.